In stock -This product will ship today if ordered within the next 2 hours and 31 minutes. Safflower oil as free fatty acids, Gelatine, Glycerol. 2-4 capsules per day to be taken 1-2 times per day or as professionally directed. To obtain maximum benefit this product should be taken in conjunction with Bio-Selenium + Zinc. Below are reviews of Pharma Nord Bio-CLA - 60 Capsules by bodykind customers. If you have tried this product we'd love to hear what you think so please leave a review. 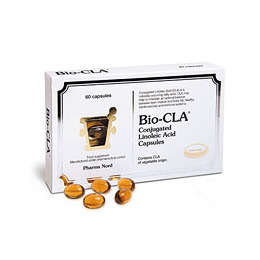 Pharma Nord Bio-CLA is the most abundant polyunsaturated fatty acid (PUFA) found in human tissues. Most of the C.L.A in the body is of dietary origin, obtained mainly from dairy and meat products.